The year is 1855. You are Dr Bergeret d'Arbois, and have been requested to present a report to the jury for a case surrounding the death of an infant. The child's mummified body was found by the owners of an apartment who had moved in just weeks earlier. The jury does not know whether the new owners killed the child, or if it was the previous owners. In order to solve the case the following question must be answered: exactly how long has the child been dead for?Using forensic entomological evidence based on the life cycle of necrophagous flies, you are able to prove that the child has been dead for approximately 2 years, long before the owners in question had moved into the apartment, thus ensuring their innocence (Benecke, 2001). 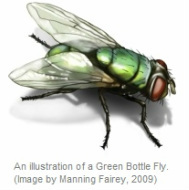 The techniques used by forensic entomologists to identify the species of Diptera present, so they can use the information to determine important facts about their case.